Ultimate stability with a modern sleek design, Marquee's concrete umbrella base is a modest alternative to installing permanent shading solutions in your backyard. 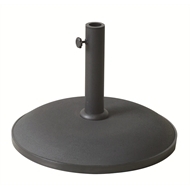 Providing shade and protection throughout the year, this base supports round and square outdoor umbrellas alike. Not only aesthetically pleasing, but providing stability and strength in Australia's tough climate conditions, this umbrella base supports a solid concrete and steel construction, ensuring endurance and reliability for creating a strong foundation for any outdoor umbrella.